Gill, aka Brinks Gilmore, is a handsome 2-year-old red brindle male, born February 12, 2002. Gill and Royal both came from the Waco Humane Shelter where they were turned in as strays. Gill's sire is King Zee and his dam is Brinks Luziann, and his grand sire was Fortress, the famous Irish racer. 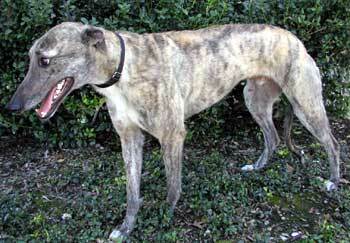 He is very affectionate and a true "companion"greyhound! Gill gets along well with other dogs, but it not known at this time if he is small animal or cat tolerant. Gill has been a greyt guest in our home from Day One. His sweet, savvy, unassuming nature made him instant friends with our male grey and female mixed breed. he really enjoys his food and treats, especially peanut butter! He's excellent on leash - no tugging or pulling. We've seen a cat or two and he doesn't show much interest but has not been "officially" cat or small animal tested. Gill's very bright! He has been quick to pick up housebreaking and he never gets on the furniture. He goes right into his crate when we say "kennel up"...'cause he knows he'll get a treat. He is good in the crate but prefers to sleep in our bedroom at night - probably because all the rest of us are there and he so enjoys company. This great boy has a truly majestic face and those soulful, melt-your-heart eyes. He's a bit shaggy right now with a coat that was obviously neglected and needs some work, but that's no problem for him - he loves to stand and be groomed. He'll soon be sleek and beautiful on the outside, the way his spirit is now! Gill is a big dog with a really big heart and a sweet, gentle personality. 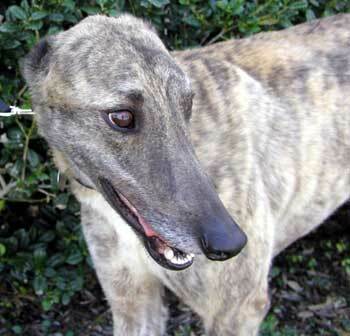 He'll be a really greyt companion for some very lucky family.